DURHAM, N.H. - Senior Ara Nazarian (Boxford, Mass.) 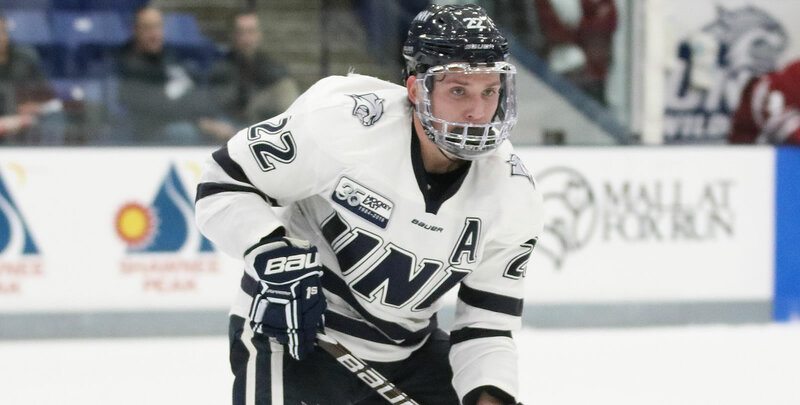 scored the game-winner in overtime as the University of New Hampshire men's hockey team defeated Maine, 3-2, at the Whittemore Center Friday evening in front of a crowd of 6,152. Nazarian posted two goals on the night while freshman Jackson Pierson (Zionsville, Ind.) had three assists. The Wildcats are now tied with No. 9 Providence for sixth place in the Hockey East standings with 17 points. The Black Bears are in the eighth place with 13 points. The top eight teams qualify for the Hockey East Tournament. The Wildcats will return to action when they take on Maine in the second game of the White out the Whitt weekend on Saturday, Feb. 2 at 7 p.m. The game is presented by Kennebunk Savings Bank as white pom hats will be the given away to the first 1,000 fans. - At 7:20 of the first period, sophomore Charlie Kelleher (Longmeadow, Mass.) sent a puck down the ice to trigger a two-on-one for Pierson and Nazarian. Nazarian got the puck in the slot and sent a one-timer to the lower glove side of the net past Jeremy Swayman to open the scoring for the Wildcats. - Twenty seconds later, the Black Bears put three consecutive shots on net from the slot, with sophomore Mike Robinson (Bedford, N.H.) making a diving save with his body to keep the score at 1-0. - After the first period, Maine outshot UNH 12-9. The Wildcats went 0-1 on the power play. - At 4:46 of the second period, Kelleher got the puck from Nazarian in the slot and sent a wrist shot to the upper glove side of the net to put the Wildcats up 2-0. - The Wildcats went on a five-on-three advantage for 1:24 but were unable to find the back of the net. - After the second period, UNH tallied 14 shots on goal while Maine had seven. The Black Bears went 0-1 on the power play while the Wildcats went 0-2. - At 14:05 of the third period, Brendan Robbins had a breakaway for the Black Bears but was met by Robinson sliding to the lower glove side of the net to make the one-on-one save to keep the score 2-0. - The Black Bears opened the scoring in the third period at 11:46 when Brady Keeper sent a shot on net from the left face-off circle that ricocheted to Emil Westerlund who sent a wrist shot to the upper glove side of the net to make the score 2-1. - Maine tied the score at 17:49 of the third period when Sam Becker took a slap shot from the blue line that was deflected past Robinson by Chase Pearson from the slot to make the score 2-2. - Neither team was able to score in the last two minutes of regulation, making this the 12th overtime game of the season for the Wildcats. - At 1:01 of the overtime period, Pierson won the face-off as Nazarian blasted a wrist shot from the left face-off circle into the upper glove side of the net to give the Wildcats a 3-2 victory. - Robinson made 37 saves to improve to 9-6-7 on the season, while Swayman posted 31. - Maine outshot UNH by a 39-34 margin. - Both teams went 0-3 on the power play. - This was the 12th overtime game for the Wildcats, tying their single-season record set in 2009-10. - The Wildcats are now 8-1-3 over the last 12 games. UNH has outscored the opposition 46-28. - This is the first win against Maine since Dec. 30, 2016 and were 0-3-3 in the previous six meetings. - The Wildcats are now 5-1-2 over the last eight Hockey East games. - Kelleher extended his point streak to five games with a goal and an assist. He has two goals and three four assists for six points. - Nazarian now has a career-best 11 goals. - Pierson's three assists and three points are both career-best marks.